A pneumatic air volume booster reproduces a low flow control signal with a higher regulated flow output pressure. It uses an unregulated input pressure to maintain a regulated output pressure under flowing and non-flowing conditions. 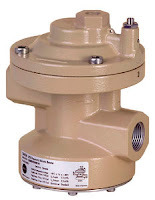 Volume boosters are also used in conjunction with valve positioners on large control valve actuators to provide faster response than possible with the valve positioner alone. Deadband within the volume booster allows the positioner to make small incremental valve positioner changes in a highly stable manor without activating the volume booster valves. The following video provides and in-depth understanding on how to use pneumatic volume boosters with valve actuator systems and how to optimize performance.